Cookies are used to help navigate on this site and are essential for it to function. To see more about them click on the 'More Information' button. At the invitation of Bro Tony Orfeo we attended an excellent Initiation at the Lodge of Three Grand Principles (No 441) at Freemason's Hall in Bateman Street (Cambridge). 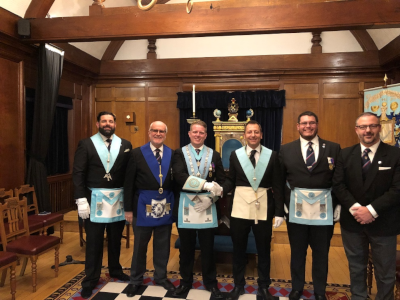 We were treated to an excellent ceremony and watched / participated in the Initiation of our newly made brother Malcolm Duffield on the 4th March 2019. 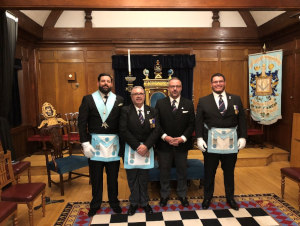 The Worshipful Master Ed Williams steered and guided word perfectly an absolutely superb ceremony with some very nice touches which were new to this Mason but made it all the more enjoyable. The candidate/ newly made Bro Malcolm Duffield had an excellent ceremony with an outstanding charge given by Bro Tony Orfeo, in one of the most dramatic and eloquent versions I have ever seen. I and the other Brethren of the Cambridge Light Blues would like to thank the Worshipful Master and all his Officers for an absolutely superb night and ceremony, followed by a brilliant Festive Board. Our thanks go out to WBro Pat Kilby, Deputy Provincial Grand Master and WBro Brian Elliott (pictured) who again supported us on the night and have been staunch supporters of CLB since it’s onset. Provincial Grand Lodge was held at the Guildhall, Cambridge on 20th June.At the Royal Arch meeting, the 3rd Grand Principal, E. Comp Gareth Jones was in attendance and gave a fascinating and engaging address to the Companions. E. Comp David Blair was invested as 2nd Provincial Grand Principal. Nearly 350 Brethren were present for the Craft meeting where Cambridgeshire Brethren were joined by representatives of 17 other Provinces and numerous side degrees.The meeting included the investiture of W.Bro Pat Kilby as the new Deputy Provincial Grand Master and W.Bro Kevin Mader as Provincial Grand Secretary. The Wardens for 2018 are W.Bro Gordon Easton as Senior Warden and W.Bro Bob Wordsworth as Junior Warden. Bullied children too scared for school will now be able to reengage with education, thanks to a grant from the Cambridgeshire Freemasons. The generous grant of £20,000, which will contribute to a bursary fund, will allow children in Cambridgeshire and beyond to receive academic and therapeutic support as part of the Red Balloon programme. At any one time, there are more than 16,000 students bullied out of school around the country, and thousands more too traumatised to attend. Red Balloon offers a lifeline to a brighter future, but the programme is expensive, and relies on generous donations. The Freemasons’ grant will allow 6-8 students who are currently not on roll with Red Balloon to access the recovery programme. On Wednesday 14th March 2018 the Provincial Grand Master, W Bro William CM Dastur launched the Cambridgeshire Festival 2023. This will be managed by the Cambridgeshire Masonic Benevolent Association (CMBA) and will support the Masonic Charitable Foundation (MCF). This aims to raise £900,000 within Cambridgeshire between now and the end of 2023. Further details can be found on the Festival 2023 website and a video taken at the launch is shown below.